Head to Sandy Spit, the perfect deserted tropical island to waste the day away on! Tortola offers yacht rentals for just about anyone, from the experienced sailor, to the land-lover (I'm closer to this category). If you think sailing is just for the super-rich think again. Here you can experience the high-seas in just about any size or shape vessel you want. So check the weather for some favorable winds, and then take off on the high seas. Before you walk down to the moorings (marina or anchorage point) and fall any deeper into your Caribbean sailing adventure. Let me fill you in on all of the styles of boats that are at your disposal. Please keep in mind you can either skipper the boat yourself or hire a professional (recommended). 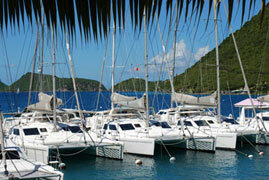 The catamaran is a mid-priced BVI boat chartering option. These yachts are distinguishable by having two parallel hulls linked together by a middle platform. This provides stability and smoother sailing. 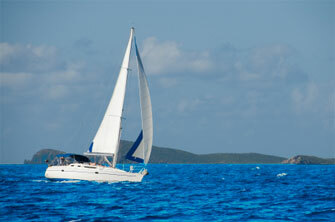 Catamarans are highly popular for exploring all over the Caribbean. As you can see from the picture you'll have plenty of these boats to choose from. Then there are the uni-hull yachts, these boats are characterized by their singular large hull. Prices vary greatly depending on the size of the vessel. Smaller uni-hulls can be a bit cheaper than the catamarans, but the larger uni-hulls will cost a good chunk more than a catamaran. Finally we have the motor yachts. For those of you who want to get a yacht rental, but don't have the patience to sail. These vessels use gasoline powered engines instead of wind to propel them through the sea. Motor yachts are the priciest of the bunch, but they also hold the most people. These boats are great if your going to throwing a big party and want to invite all of your friends. You're probably thinking how many more options can there be? Actually a few more. If you're into being completely pampered and don't wish to skipper the boat yourself, then try the crewed charter. You won't have to lift a finger, the crew will take care of your every need. 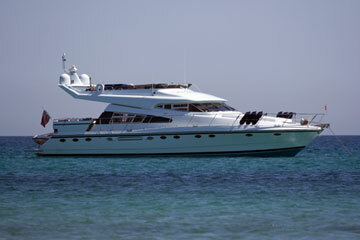 There are also bareboats, which are charters rented with only the bare necessities (no captain, crew, or provisions). I ended up choosing the bareboat option. We rented a bareboat and soon found ourselves on a secluded Jost Van Dyke beach. In fact I don't think we saw anyone there for several hours, it was great! Marina Cay is a popular and lively hangout for the sailing crowd. One final option is your length of departure. You can rent a yacht for a day, or for a few weeks. 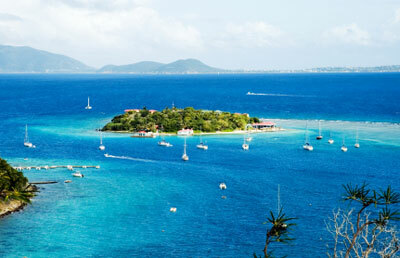 I'm a bit to cheap to go for more than a day, but sailing BVI for a week sounds like a dream come true!